Last week we were invited along to Showcase Cinemas Southampton to see the new Sherlock Gnomes film. We were being invited to watch the film 2 weeks before it goes on general release! The kids thought they were VIP’s! We had seen this film advertised and it admittedly had attracted my kids attention. I am sure if your kids watch this trailer they will be after seeing Sherlock Gnomes too! 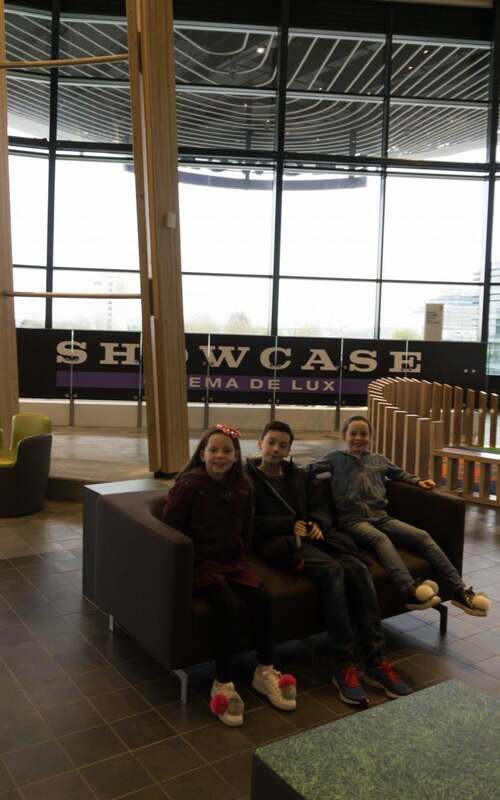 We were invited along to Showcase Cinemas in Southampton. 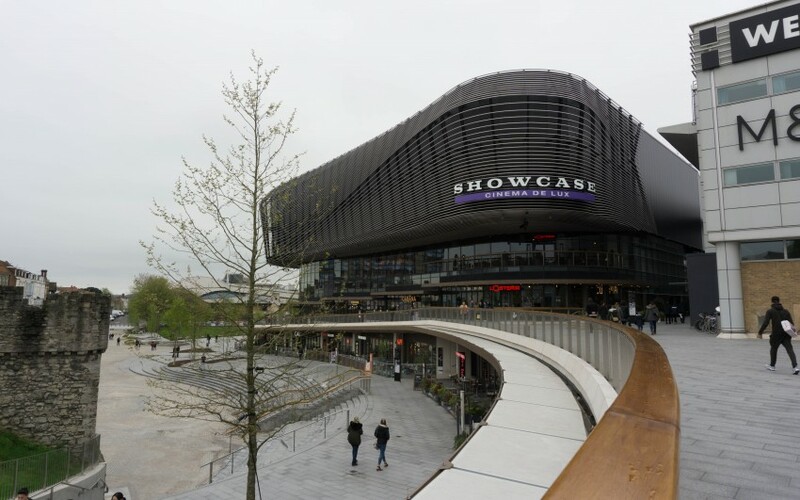 This is the new luxury cinema based in West Quay, well I say new….it’s been open about a year but we have never made it along! I have heard great things about Showcase Cinemas though. This isn’t a normal cinema, it is a little something extra and we were very excited to experience this. 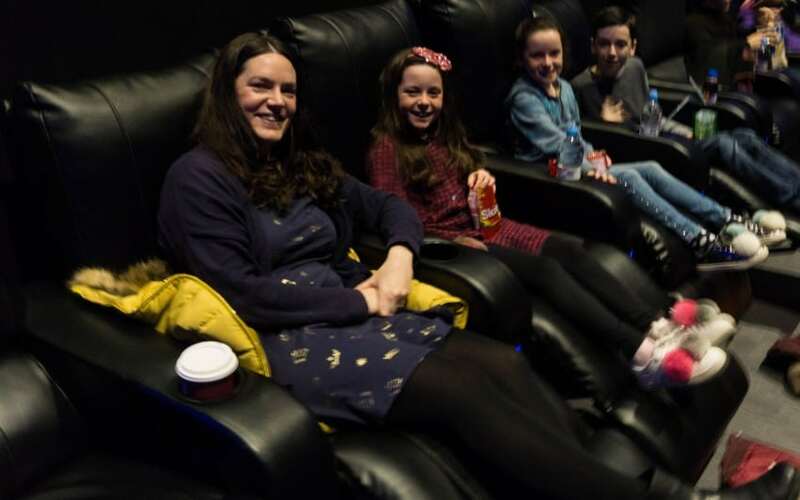 It was very tricky to get photos in the dark but if you look at our seats you will notice we are seating in the most comfiest luxury reclining seats! I cannot tell you how comfy these were and how much fun the kids thought they were! After my back issues going to the cinema wasn’t a pleasant experience for me. The chairs are usually uncomfy, squished in and I cannot wait to get out. Not these ones! I could have sat there all day in those seats. With my feet up, drink holders, electric reclining footrest and back rest! Also if you notice in the above image you aren’t sat close to people above or below from you. Each row has plenty of space and you have a wall separating each row. This was perfect as a family as you don’t feel like your kids are close to other people annoying them, and also you are above the people in front of you. So no need to worry about little ones having a person’s head blocking the view. All of mine could see over the wall clearly and not a person’s head in sight! My only disappointment was the cost of the sweets! It was £18 for 3 bags of sweet, 2 bottles of water and a juice. The film started and I could tell the difference in the quality, both visually with a bright and clear image and the multi-dimensional sound was brilliant. The same as the seating, large and spacious, so was the screen! Spreading the width of the large room. I struggle to write about film reviews because I don’t want to give the plot away for anybody but it was a great film! My children are 13 boy and twin girls 8, and it ticked the boxes for both age groups. Which is usually quite hard to do with that age gap. Us as adults really enjoyed it for a kids film too. There was some brilliant jokes in there that went right over the kids heads and had us giggling! The story is based around following the Gnomes who mysteriously vanish from their new garden in London. 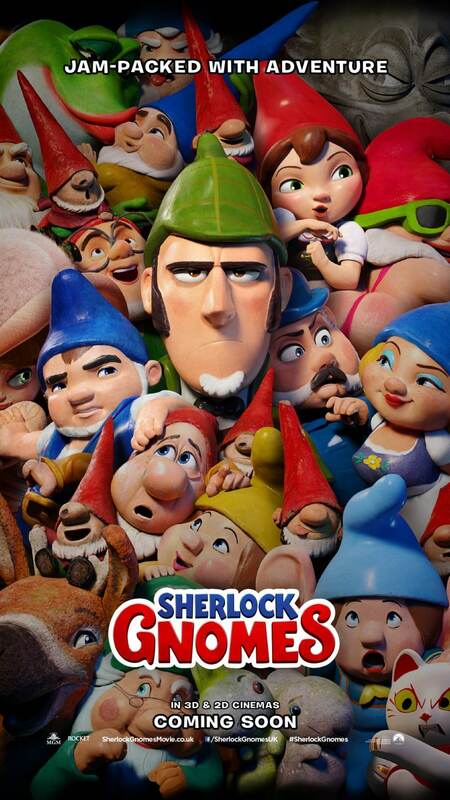 Sherlock Gnomes takes it upon himself to investigate who has taken them and to follow the clues to rescue them all. However he has some tag alongs on this journey too! His trusty sidekick Watson, Juliet and Romeo. Will they be any help in solving this mystery or is it all left to Sherlock to solve? I got the children to write a little bit about the film to see what they thought too. I think that Sherlock Gnomes is a great movie for the younger children and but also is good for older people as it definitely has some great adult jokes sneaked in there! I liked the voices of the gargoyles especially the one sent to look after the gnomes while they are in the house. My favourite part was the ending as I like how everything was set to be nice again and I’m a big fan of a happy ending! I thought Sherlock Gnomes was amazing, funny & adventurous. My favourite part was all of it, I can’t decide! I thought Sherlock Gnomes was a fantastic kids film. With twists and surprises. My favourite part was when they flew the drone around Tower Bridge at the end. I love drones! Me and my husband loved working out who was who by recognising the actors voices! Sherlock Gnomes is filled with great actors who played their parts very well. Including, Johnny Deep, James McAvoy, Emily Blunt, Matt Lucas, Ozzy Osborne, Julie Walters to name just a few but there was so many more great ones. We had a great visit to Showcase Cinemas Southampton to see Sherlock Gnomes and I would recommend a visit to them both. Currently the cost of a family ticket for 4 is £30 for both peak and no peak times. See the cinema for more prices. *Sherlock Gnomes is on general release from 11th May 2018. We were given tickets to see the film in return for this blog post. Oh we haven’t seen this yet but my children really want to watch it! The cinema looks great and it sounds like you had fun! Its worth a visit if you fancy it, great film! I love those seats! I hadn’t realised Sherlock Gnomes was out yet, my husband and son are keen to see it! 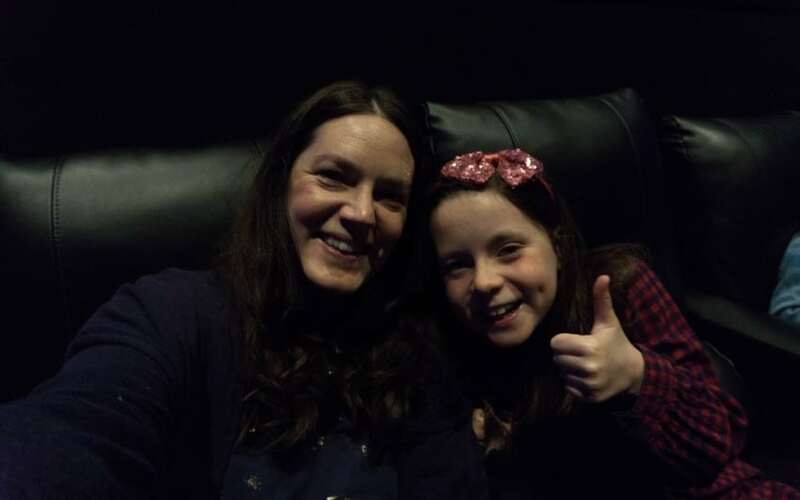 We went there last year, the girls loved the comfy reclining seats! Not heard of the film before, looks interesting. There has been one released before if you want to see it before this one. The seats are good fun for them aren’t they!! Really looking forward to seeing this film. We have a Showcase De Luxe near us and have been quite a lot but I do find it quite expensive. 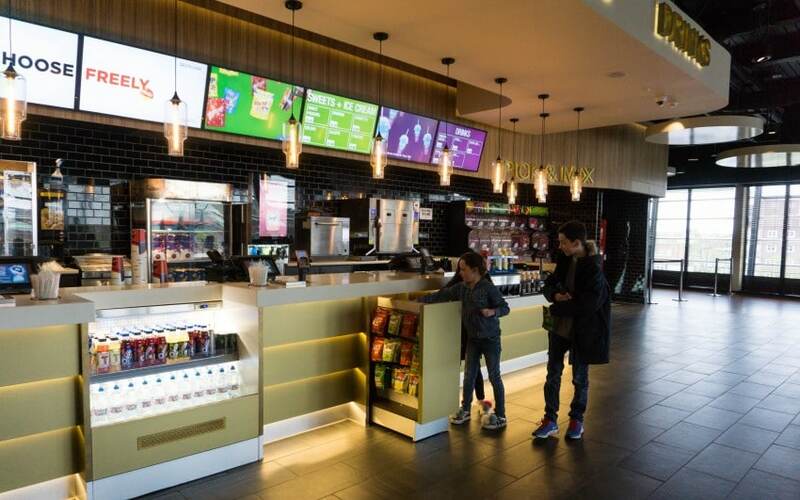 Our small local cinema is perfect for the kids and it means we can go and see more movies too. Yes I know what you mean. It’s good for a treat isn’t it though! I think I will be back if I go out with my husband on our own! It’s worth a watch, very funny for us adults too! Looks mad from the outside doesn’t it! I love the sound and concept of this film. Looks like you had a great time. I love how your little ones did some reviewing too!! Thanks, they loved it and have been telling their friends to go along!! I have not been to a Showcase Cinema in ages. Good to know you liked the quality of the movie. We had a great time, so nice to watch a film in a comfy seat! This sounds like something my kids would really enjoy! I’ll have to check and see if they’re showing it where I live. It’s such a fun kids film that adults don’t mind watching either! Yes I didn’t realise they had so many places to eat around there too. Loved the seats! This looks like such a fun film and definitely sounds like a must see. Them seats at the cinema look so comfy btw. They were so so comfy! 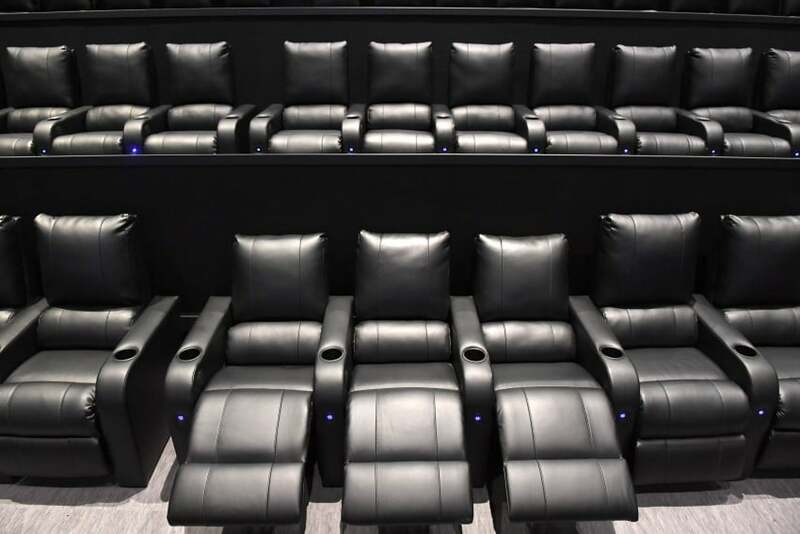 Wow that cinema looks very fancy – loving the chairs!